Learn the complete, proven, step-by-step system to attract great clients and build a thriving, rewarding and profitable coaching business. Used by thousands of coaches worldwide! Top Selling Audio Program! Originally delivered as a half day pre-conference workshop for the International Coaching Federation Annual Conference. 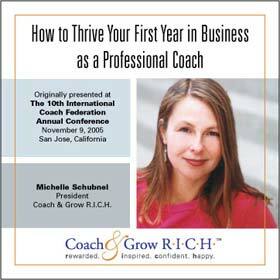 Discover the 4 “Keys to Success” necessary to build a thriving, rewarding an profitable coaching business. Learn step-by-step how to grow and nurture a large and responsive email list so you always have a steady stream of new clients and customers. Want to get clients by offering a free teleseminar? This “Done-For-You” package makes it super easy. You get EVERYTHING you need to offer and deliver our high-value “Best Year Ever” teleseminar proven to attract clients.